Islands & Lights! Ålesund's glistening waterways entice and adventure beckons! An Island-Hopping extravaganza to Ona Lighthouse is a paddlers dream. This setting with savvy leaders and fail-safe gear await you on our Ona Light Paddle Mania. This trip is suited for paddlers as it takes you out beyond the shelter of the fjords where we navigate intricate archipelagos, play in rock gardens and spend a few long days rocking and rolling with the swells of the North Atlantic. A unique string of islands run North forming a natural barrier that slows the rushing waters of the Northern Atlantic; with the sun at our backs we aim our kayaks North paddling over open crossings with wacky currents and exhilarating tidal races. Our kayaks glide around outer islands laid out like a string of pearls; dotted with abandoned farms, quaint villages and signaling beacons that shine on treacherous shorelines where ocean swells roll up on pebble speckled white sandy beaches. Home to eccentric islanders and wild woolly sheep these weather-beaten islands lead us to the remotest marker, Ona Light. Navigating rocky islands and shoals when finally, the ‘rising of the light’ and the first glimpse of Ona Light. Feeling like ancient mariners our paddles blaze a path to our destination, this famous lighthouse. A beach front campsite where a delicious supper of local delicacies prepared with natural ingredients is served in the great outdoors. A cracking fire, good company and warming night-cap, rounds off the evening before retiring to a cozy tent for a well-deserved rest. Thursday, meet your guide and support personal at Kayak More Tomorrow’s Meet & Greet, 17:00 (5:00 pm) at the Scandic Hotel Ålesund. We pick you up at your hotel at 09:00 for the transport to our launching site, here your guide will hold a pre-trip briefing and outlines your route, then we gear up for launch time. Leaving the city behind, we head North to the string of islands that lead to Ona. Navigating the waters while jumping from islands to island, our chosen route is dictated by prevailing tides & winds, the groups paddling abilities and our paddling speed. After a good days’ paddle, we arrive at camp for a great meal and a well-deserved rest. Morning coffee and breakfast fuel us for the paddle ahead, our goal this morning is Ona Lighthouse. We hope to arrive around noon. As evening encroaches we search out a campsite for the night; another great meal is prepared and enjoyed outdoors before we retire to our sleeping bags for a good nights’ rest. Morning coffee and breakfast fuel us for todays’ final stretch into Ålesund. The city beckons in the distance, cruising around the last island before making the final crossing of Ellingsøy fjord and gliding down Nørve Sound to our landing site in Ålesund’s Southern harbour. 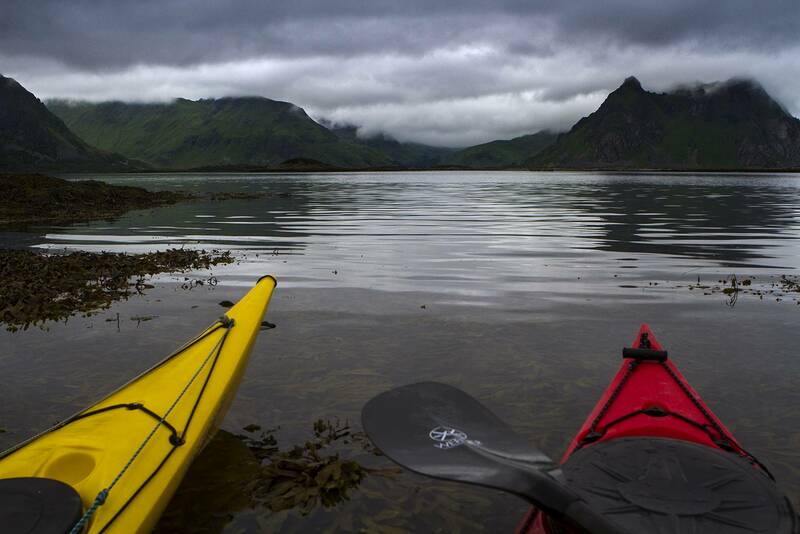 The waterways of Ålesund’s archipelago boast an Eldorado of magnificent paddling opportunities. Gliding amongst picturesque islands, paddling along steep granite walls of jade green fjords, or challenging the rolling waves of the North Atlantic where white sandy beaches speckle outer islands that abound in bird and sea life.